Hey guys! I mentioned in yesterday’s post, that not only did I refinish my old tile table, but I gave the whole dining room a bit of an update as well! This is my very first ever room makeover, so be kind! I really love the transformation and my little family does as well. After I was finished, my husband who typically couldn’t care less about decor of any type said, “wow, this kind of makes the rest of our house seem kinda drab doesn’t it?” Bahaha. I took that as a huge compliment, and I am excited to get to update the rest of the house slowly but surely (dang budget)! Here is another quick look at the “before” so you can see for yourself what I was working with. As you can see there wasn’t much there to go off. 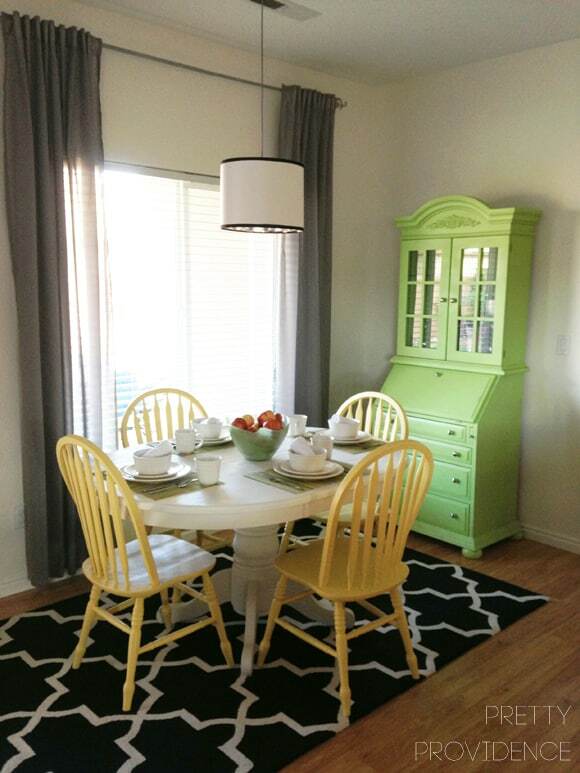 I didn’t like the oak, didn’t like the dark colors and didn’t like the ugly light fixture. 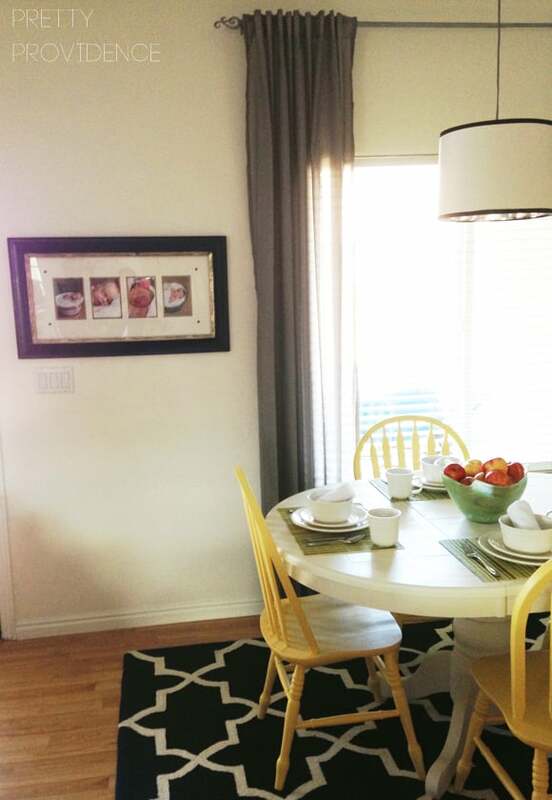 My sister Kelsey studied interior design in school and now works as an interior designer for Ethan Allen in Salt Lake City. She (in addition to Pam and Sarah) is my sounding board on all things design. So, when I decided to do this she was the first person I called. I told her my ideas, and here is the gist of it. 1) I want it to be bright and happy. 2) I want to use the things I have if we can because this needs to be as cheap as humanly possible. 3) I am painting my table white. She is amazing and of course wanted to support me any way she could, so we started brainstorming. 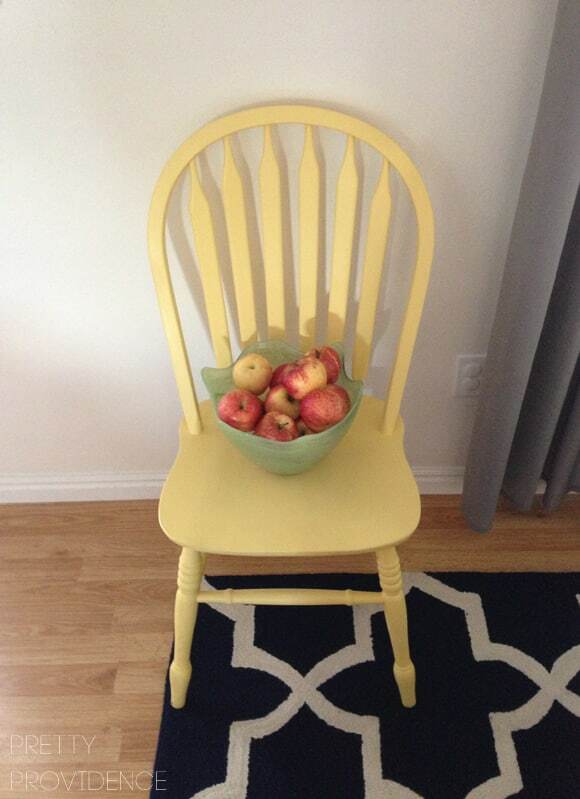 We decided paint colors for the chairs and hutch first. I knew from the start I wanted to add in Navy somewhere, because it is my favorite color right now. We picked the grey curtains last and can I get a hallelujah for IKEA because not only are they LONG but they were CHEAP! 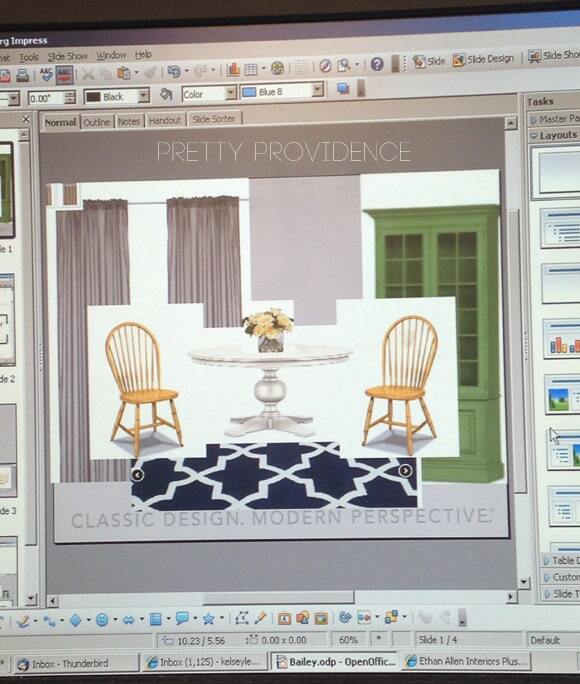 After we decided on our basic game plan she drew it up for me and sent me this screenshot of her computer, so I could be sure I liked what I saw before I reached the point of difficult return: *By the way, she does design outside Ethan Allen as well and can design in any style. Message me if you want her info! Anyway, I liked the general feel of the room and decided to move forward. 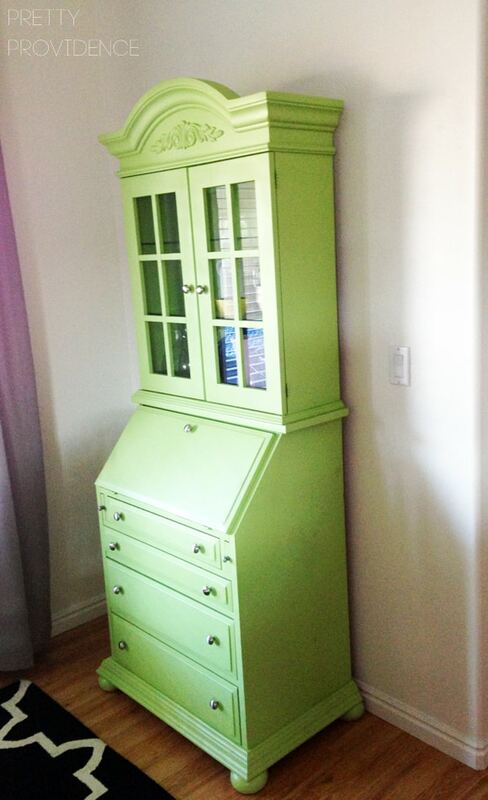 I just wanted the table to be a little bit more of a creamy white and the hutch ended up a little brighter green, which I was unsure about at first but now I love! Okay, are you ready to be bombarded with photographs? After we do a little tour I’ll give you the price breakdown and store list. Also, can I please note (out of embarrassment) that I am in no way a professional photographer, and it is really hard to get good photos of “large” spaces without a nice camera. Fortunately, I have been a very good girl this year and I think Santa is bringing me a dslr! ^^This photo was taken from my living room area, you can also see the bar stools on the right (which we painted to match the table) and my gratitude board. ^^I am loving my creamy white dishes. ^^A sampling of the rooms color pallet. ^^From the kitchen. ^^I am a sucker for fresh/real centerpieces. Okay are you ready for the breakdown? Here we go. -The paint for the table, chairs, barstools and hutch were all bought at Lowes. The paint colors were all Benjamin Moore colors, because those are the color decks Kels uses, but the great thing about Lowes is that they can match any color from any brand! (This post is not sponsored, I just really love Lowes..) For more detail on how I refinished the table, see this post. -New hardware for the hutch was also purchased at Lowes. I bought the cheapest silver round ones they had and they have worked great. -The rug was on clearance at rugsusa.com (SCORE) and even though it was the most expensive part of the room, it is an %100 wool gorgeous rug and in my opinion it completely makes the room work. -The curtains were from ikea (and can I mention I love them so much?) they are simple, long, clean and the price does not get better. Trust me on this, I’ve shopped around. -The light fixture is also from Lowes. I looked and looked at the lights and they were all a bit out of budget. I decided to check out the lamp section and I found this beauty! It was exactly what I was looking for and at the right price. It brings plenty of light for this little corner as well. 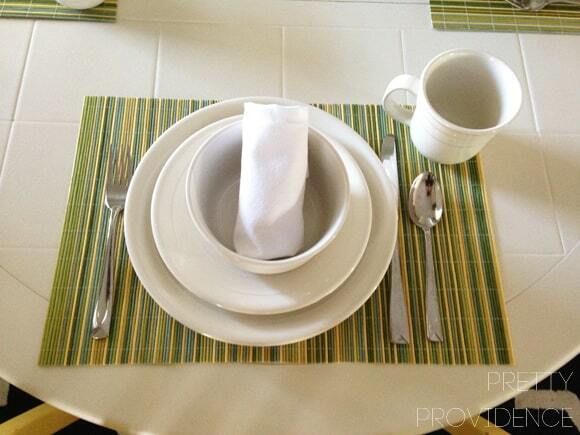 -The dishes, green bowl and cloth napkins are all from TJMaxx. I already had the silverware and place mats. 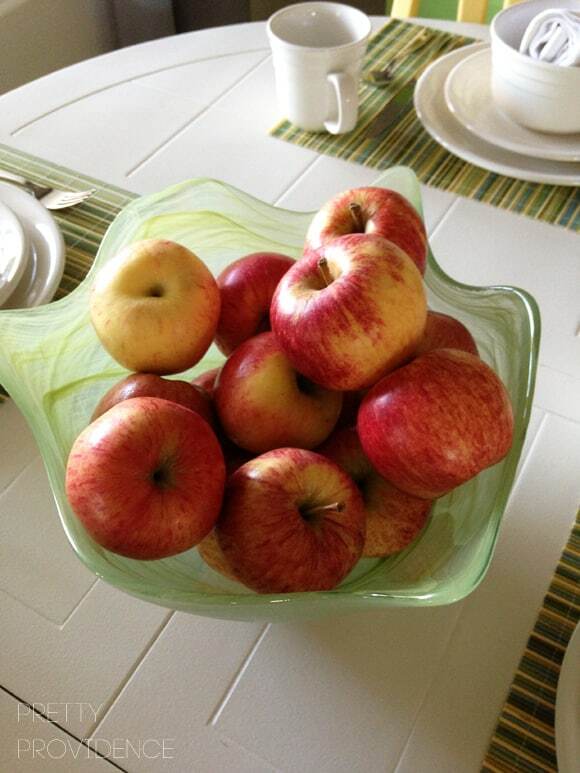 Apples from Costco, haha! Now you know all my favorite places to shop ;). Considering I finished the whole room for less than it would have cost to replace my old table, I am feeling pretty proud! Well, what do you guys think? 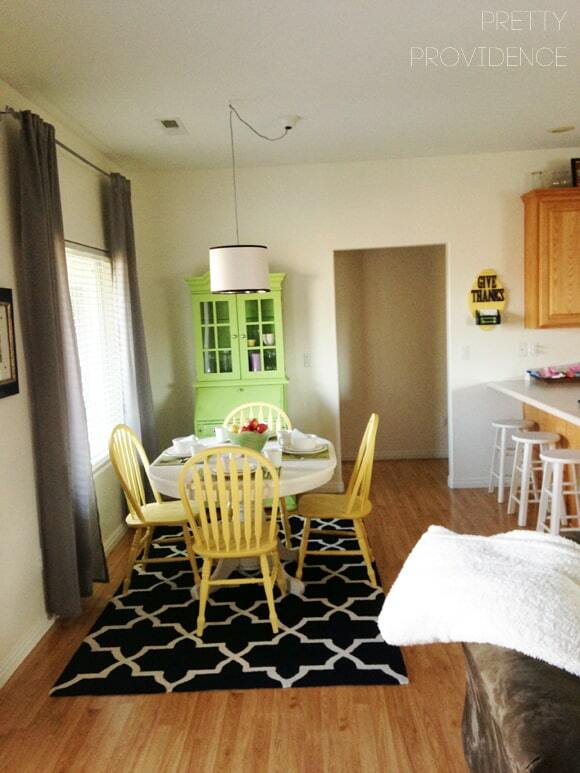 I know the colors aren’t for everyone, but I am loving how bright and happy my new dining area is. Love you guys and thanks for reading! If you liked this post, make sure you check out Sarah’s tiny little house tour, 24 amazing DIY headboard ideas and 15 DIY ottoman ideas! Yay!! I like my table about a million times better now! I’m so glad you like it too! Hi Jessica! I loooove this makeover! 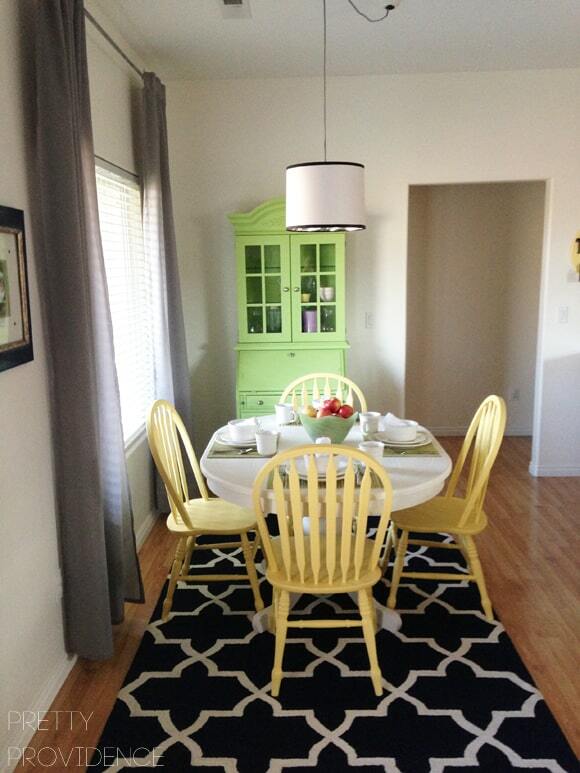 I have the exact same dining table set and I wanted to know what color you used to paint the chairs? Love your pics and projects. You are great at explanations!! You have a new “friend”. Thanks!! Aww thanks so much!! You just made my day!! 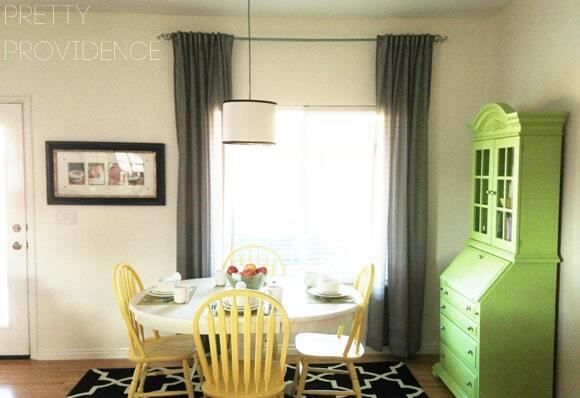 I love the green, Jessica, and the painted furniture is such a huge transformation. Great job! You’ve made your home look so cheerful. Thanks so much Heidi! You are the sweetest! Oh my gosh I am in LOVE! This is absolutely gorgeous-I love the contrast with the rug! Makes me want to do a makeover on our place! Aww thanks so much Maya!! You totally just made my morning! Thanks Devri! You should do it, you will love it! Our budget for groceries right now is $300 a month, at the start of the year we usually do a budget re-vamp and evaluate changes etc. At that time I’ll do a more detailed post if that would be helpful! Oh my goodness I love this! We have a lot of old furniture that I really want to start painting and refurnishing. We’re moving in a few weeks and getting out all our stuff from storage so I need to start working on it! Great inspiration! Pinning! I LOVE IT. It’s so cute…. love the color scheme you chose girl! Thanks girl! I love you!! Looks great. 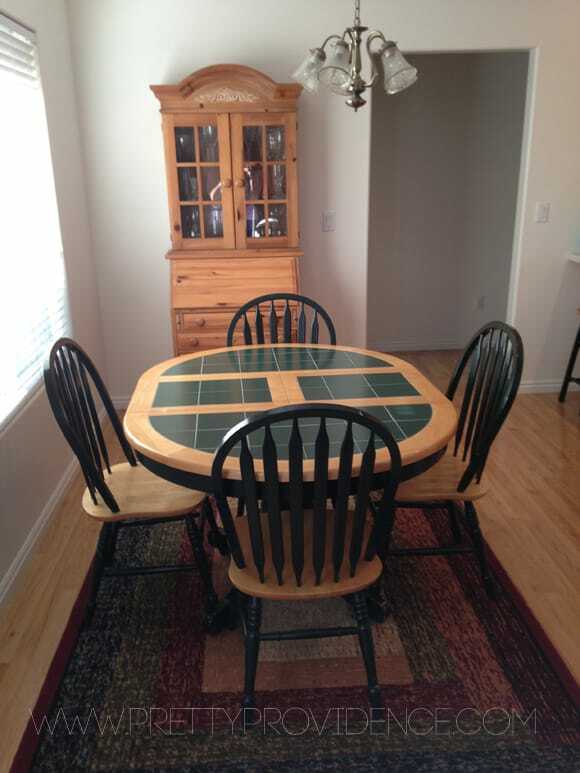 Our kitchen table and chairs are that style, but without the tile on top. I should be brave and paint it! I love the bright white. Also, this is somewhat random, but have you shared your monthly budget for groceries before? We are also a family of four and I was wondering if you would be willing to share? Thanks. So much brighter. And I love the rug! I know the rug is my FAVE! Thanks so much ☺️! The room looks fab! 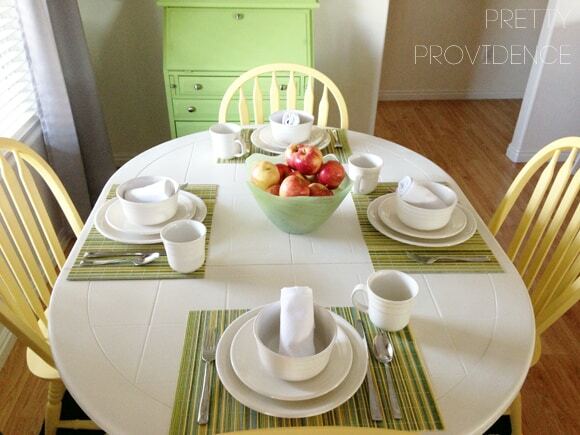 I can’t believe how different the table looks, you’ll have to let us know how the paint over the tiles holds up! It’s held up well! It has been almost nine months with me wiping multiple times a day, so I’m really pleased! I’m sure eventually well have to do another coat just on top of the table, but so far so good!